What will the new schools look like? Both of the new schools (K-8 KK and K-8 LL) will include high quality learning areas which feature movable walls between two classroom teams as well as extended learning areas for collaboration opportunities. Each facility includes state of the art technology and excellent core facilities that include a media center, cafetorium, playgrounds and physical education fields. 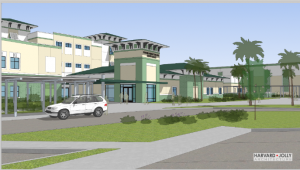 The design being used for both K-8 schools is a modification of Patriot Oaks and Valley Ridge Academies with the addition of a third floor that will house 8 classrooms, three science labs, ESE classrooms, a Technology Lab, Business Lab, Skills Lab and Resource Room. The planned capacity for these two schools is approximately 1,490 per school. By using existing prototype designs for these new schools, the School District will save both time and money. Who will attend the new schools? As a result of the new School Choice legislation, will these schools have capacity/controlled open enrollment? In accordance with the District’s controlled open enrollment procedures, new schools will not be eligible until the completion of the third year of operation. 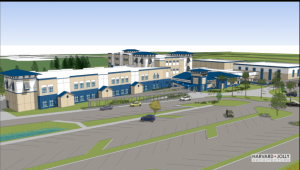 Will the Nocatee Duval County students be able to attend the new K-8 school to be located in the Twenty Mile Village? At this time students residing in the Duval County portion of Nocatee can only attend St. Johns County schools through the controlled open enrollment process. K-8 School KK will not be eligible for controlled open enrollment for the 2018-2019 SY. Will the rising 5th and 8th graders attending these schools be allowed to stay at their current school? Will my child be able to finish at their current school? Will transportation be provided? The Superintendent has determined that both schools KK and LL will open as K-6 schools for the 2018-2019 school year (SY), add grade 7 in 2019-2020 SY, and grade 8 in 2020-2021 SY. This will allow all students presently in grades 6 and 7 in rezoned areas to continue at their present middle school assignment. These students will continue to receive the same transportation as currently provided. This plan will provide educational, social and emotional stability during pivotal transition years for these students. Extracurricular activities for middle school students will be based on the model for activities/programs at other K-8 schools. School district middle school sports of volleyball and basketball will be available although some modifications may need to be made in the first year of the school. Performing arts programs such as band and chorus will be developed at an appropriate pace based on the students enrolled. The district will support the new schools to ensure the middle school experiences for students in the first three years of operation meet the range of student needs. Additionally, present Patriot Oaks Academy (POA) 4th grade students who are rezoned for Durbin Creek Elementary will be allowed to stay at POA for 5th grade and then move to Fruit Cove Middle School for grade 6. All current 4th graders who were rezoned to either KK or LL will transition to the new school as as 5th graders. Who will be the Principal? Teachers? The principal for K-8 KK and K-8 LL will begin work in that role in the spring of 2018. One of the first responsibilities of the new principal is to build a school staff. The Human Resources Department will develop a process for transfer of teacher and school staff and selection of new employees. Jessica Richardson, principal at Ocean Palms Elementary School (OPES), has been selected by Superintendent Tim Forson to be the principal of K-8 school “KK” currently being constructed at 2135 Palm Valley Road, Ponte Vedra, 32095. Allen Anderson, principal at Palencia Elementary School (PES), has been selected by Superintendent Tim Forson to be the principal of K-8 school “LL” currently being constructed at 1365 Shetland Drive, St. Johns, 32259. Will my child receive transportation? Transportation bus routes are not developed until the spring of each year. Generally, students that live within 2 miles of the school are not funded for bus transportation and, therefore, will not be eligible. Once developed, final bus routes will be posted on the district website and communicated to parents. What will be the start and end times for the new schools? The start time for the new schools will be the same as current elementary schools and other K-8 schools. School will start at 8:30 a.m. and release at 2:50 p.m. There will be a one-hour early release on Wednesday at 1:50 p.m.
What academic programs / Pre-K programs / ESE services/ Extended Day/ Advanced programs will exist at the new schools? Each of our schools provide high quality academic programs and our new schools will be no exception. Advanced programs are offered at all schools. With respect to Special Education services, the School District serves all students with disabilities in the least restrictive environment. All schools have the following services available based on student need: Physical Therapy, Occupational Therapy, Sign Language Interpreting, Hearing Itinerant, Vision Itinerant, Speech/Language Therapy (including Pre-K walk-in services.) These services will be provided through consult/in-class support/resource models. Gifted services will be provided by either a blended, resource or consult model. There will be no self-contained classrooms at the new K-8 Schools KK and LL. There will also be no Pre-k program at either school. The new schools will also have Art, Music and PE programs. They will offer Interscholastic Sports and Student Clubs. The schools will form both a Parent-Teacher Organization (PTO) and Student Advisory Committee (SAC). An Extended Day program will be provided, however, the details regarding its formation and operation is a school-based decision and will be determined in the Spring by the school principal. What foreign language opportunities will exist? The principal will work with the community and staff to make the best selections to meet the needs of the students. When will the PTO for each school form? After the new principal is selected, he/she will begin working with the school community on forming the PTO. What technology will be available in the classroom? There will be a presentation system including a document camera to display and magnify and sound enhancement technology in every classroom. In Grades K-5, there are also approximately four devices for student access to technology. Grades 6-8 will have access to fixed or mobile computer labs. Where will I go to register my child while the schools are under construction? School registration locations have not been determined at this time. More information will be provided on the School District’s website at a later date. Current students will not have to re-register, but will be transitioned based on the approved Attendance Zone. The District will release pre-registration dates for Kindergarten in early 2018. Will students be able to bring tablets (laptop computers) from home? Yes. Students bringing devices from home will sign a technology waiver form and must use the tablet/computer according to teacher/administrator guidelines. Will we have e-books or textbooks? Our students will have traditional textbooks in addition to online learning resources. What types of clubs or extracurricular activities will be available? Clubs/activities will develop through collaboration with students, parents, and staff. Will there be a character education program? SJCSD uses Character Counts! as the foundation for our character education programs. How will student leadership be developed? The development of student leadership is a goal at all SJCSD schools. The principal determines the appropriate strategies and initiatives to implement at their school. How will the 6th graders participate in sports? Current middle school and K-8 administrators will work together this spring to coordinate 6th grade games into the 18/19 (volleyball, basketball) schedule when competing against the new K-8 schools. What resources will be available in the media center? The media center will have a collection of both traditional books and eBooks. What is the general timeline for opening new schools? For additional information on the St. Johns County School District, please visit our District Facts web page.